Since we're young, we're taught how to talk, behave, and live. We're different because life gave us different circumstances. Our families, our entourages, the culture, the religion, the mindset and the collective principles...these are external factors that have directly shaped our present realities. You see, these influencing factors...you first understand them, and then you learn to apply them. Eventually, they become a part of you. That's how your mindset is shaped. So what does this have to do with self-motivation? Well, first off, motivation is produced by a brain chemical (dopamine). Therefore, when it comes to self-motivation, the mindset we possess is the most critical mechanism that provokes that release of dopamine. That, and other factors. However, our mindset doesn't just develop by itself. We have to contribute by acquiring the necessary knowledge. Many spectacular individuals have dedicated their lives to understanding other people's brains, emotions, and behaviors. And mostly, the studies have been performed on successful people specifically. As a result, several life-changing books have made their way into the marketplace. 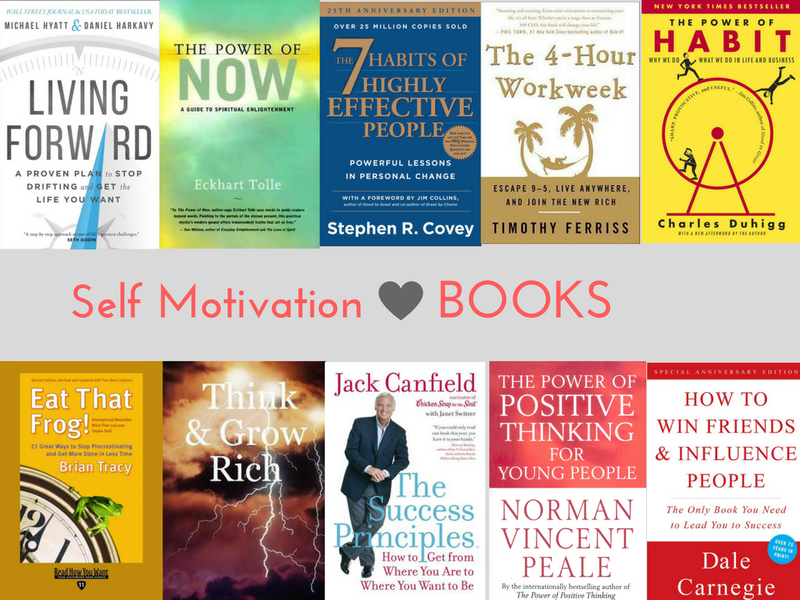 In this post, we're presenting 10 amazing books on self-motivation that will change your understanding of motivation once and forever. PS. In order to better organize your reading, I’d suggest taking a look at these best “read it later” apps. Whenever you find a potentially interesting book, make sure to save it. Moreover, you should also get accustomed to a reading app that’ll make reading very easy. A reading app will allow you to read on the road. The only thing you’ll need is a smart device because most of them can save content offline. Stephen Covey is not just trying to motivate you. He’s also teaching you how to perceive life from the eyes of a successful person. You’ll learn important life principles that will prove to be practical instead of philosophical. This book should help you remember what you already know, all while motivating you to take more action. This is a great resource for both personal and professional development. You’ll learn a lot about other successful persons from around the world. If you know what their habits are, what their thinking is, and what fundamental life principles they adopt, you can model their success. Brian Tracy is an amazing motivational speaker, businessman, and best-selling author of several personal development books. Eat That Frog is one of his classics, and it incorporates a pretty straightforward principle: focus on your most important/daunting/difficult/stressing task the first thing in the morning before you do anything else. Moreover, the book presents numerous strategies and success principles that will help at shaping your mindset – which will eventually lead to increased motivation. “Successful people don’t try to do everything. They learn to focus on the most important tasks and make sure they get done” – Brian Tracy. Think and Grow Rich by Napoleon Hill is that unique piece of art that could encounter no direct competition. This classic incorporates the author’s philosophies and ideas about successful people. After he studied more than 500 people that witnessed abundance and success, he’s put all his knowledge into one book. This motivational masterpiece helps you develop goals, approach challenging life situations, and build wealth in all areas of your life. Throughout the lecture, you’ll understand how our thoughts and minds can attract powerful energies and outcomes. That, of course, if we know how to attract them. If you want to learn how to make a friend out of anyone, this is the book that’ll change your life for the better. Dale Carnegie shares insightful and easy-to-digest advice on how to handle people, how to win people’s sympathy, and how to change people without sparking adverse effects such as resentment. However, this read doesn’t just help you deal with other people. It also helps you get rid of disempowering mental habits that are ruling your world. Because of these habits, your interpersonal relationships are suffering actively. This book will make you a much better communicator and person to be around. Of course, it has a motivational side too! If you haven’t read this book by now, you’re missing a lot. To be more precise, this book helps you unlock different perceptions and thoughts. You’ll encounter numerous breakthroughs, as the book is emphasizing a spiritual aspect that is always within us. As the name of the book inclines, we can unleash our personal powers by focusing on the present moment; focusing on the “now”. Here’s another international best-seller that helps individuals from all around the world understand the “power of positive thinking”. Dr. Norman Vincent Peale hopes to aid individuals in finding fulfillment in life and set them on a positive path towards personal happiness. This book has a motivational side, as it gives the reader formulas for developing high levels of self-esteem, self-confidence, and much more. Timothy Ferris is a unique type of entrepreneur. He doesn’t shy away from stating that starting an online business or hiring other smart people under your command is the best way to live a relaxed yet abundant life. He explains principles like the 80/20 rule, productivity barriers, and more “hacks” that will help you escape the 9-5 hustle. The concept of outsourcing is highly emphasized, as the author teaches his readers how to take advantage of their resources in order to free up their time. Jack Canfield wrote an amazing self-motivation book that will take you from point A to point B, only if you’re willing to take action. You’ll discover practical advice and strategies on how to tackle daily challenges, stick with your goals, and create an amazing power of commitment towards success. The book contains insightful stories coming from successful entrepreneurs and CEO’s from all around the globe. If other books contain a few principles, this one incorporates 64 proven principles that seem to attract success. We often get stuck in life; most of us can’t figure out what we really want, what our purpose is, and what we need to do in order to be happy. Living Forward is a book that should change your perception once and for all. The authors promise to teach us how to design the life we crave for by starting with the end in mind. Besides the practical insights you’ll receive, you’ll also tackle your spiritual juices. You’ll begin to wonder things that have never crossed your mind before. This openness is the key to staying motivated. Did you know that habits that are properly formed and nurtured can put you in a state where you no longer need motivation? Habits are powerful and this book explains all there is to know about them. How they form, how you can influence their development, how you can remove the disempowering ones, and so on. The Power of Habit is a great book in case you’re struggling with your life habits and routines. If you haven't read any of these books, that should be a strong sign that you haven't yet started your personal development journey. When you finish just a few of them, you'll be hooked. Moreover, you will a much more motivated person. No more procrastination, no more frustration, no more disappointment. Just the joy of productivity! Olivia is a journalist, content-writer and a bookworm. She loves to teach, read and write. Her second biggest love after books is her cat called Patty, who usually kindly assists her while writing for Aussiewritings.com. Follow Olivia on Twitter.